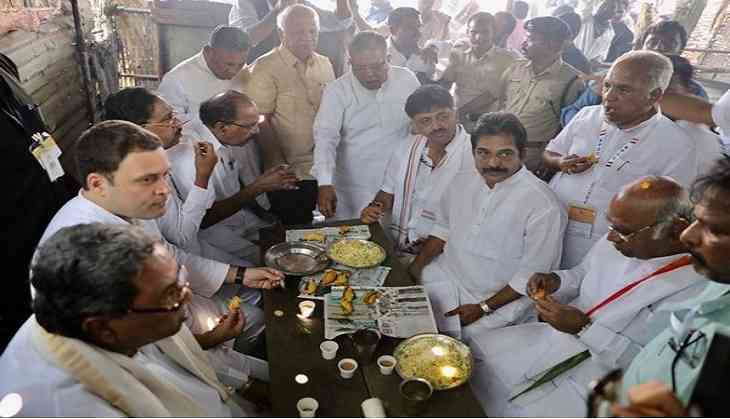 Congress President Rahul Gandhi on Monday devoured local cuisine mirchi pakoda and tea (called as 'bajji' in Kannada) at Kalmala village in Raichur district. Rahul is in Karnataka, campaigning for the upcoming Assembly polls, dates for which are yet to be announced. During his ongoing 'Jana Aashirwada Yatra', Rahul stopped for a tea break at a local dhaba at Kalmala village, Raichur. He, along with Congress leaders, visited a hotel and had Mirchi Bhajji and puffed rice, which was served by owner, Maramma. Karnataka Chief Minister Siddaramaiah, Mallikarjun Kharge, Karnataka party in charge K C Venugopal and Minister DK Shivakumar accompanied Rahul Gandhi. The schedule for the Karnataka assembly elections is yet to be announced. Earlier in the day, Congress President had visited a Dargah in Raichur with Siddaramaiah and later conducted a roadshow in the city.